The bullish momentum of the euro vs dollar came to a temporary halt yesterday, as the US dollar finally found some support in the markets following the FOMC meeting and the continuation of the G20 meeting in Pittsburgh, which is continuing to cause the forex markets to react nervously to any comments or statements. From a technical perspective, yesterday’s wide spread down candle simply confirmed the tweezer top of the previous day which has now formed marginally above the 1.4800 price handle, and closed the forex trading session with a deep upper shadow confirming the bearish sentiment. 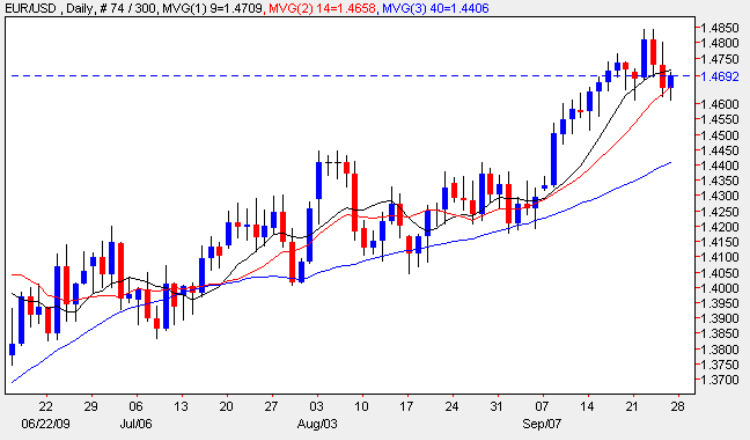 However, before we assume that this is a signal that the bullish trend is stalling for the euro vs dollar, it is interesting to note that the low of the day found strong support from the 14 day moving average, suggesting from a technical perspective, that this is only a minor pullback, and that the upwards trend is still intact. The key now of course will be whether the tweezer top now formed has sufficient authority to quell any sustained move higher, and at present this seems unlikely given the support from the 14 day moving average, so we can expect to see a retest of the 1.4800 price level in due course. All the fundamental news on the economic calendar for the euro vs dollar pair is covered for you in more detail on the euro to dollar site, in what is otherwise a relatively quiet day ahead of the weekend. The key meeeting is ofcourse the continuation of the G20, and next week the markets will return to normal following the combined effects of this and the FOMC meeting earlier in the week.